It is time to celebrate our Great American Main Street City! Main Street, along with many community partners, is hosting a celebration to which all community members and supporters are invited. The Hometown Celebration is a free community event celebrating Milledgeville. The event started in 2014 to honor the accomplishment of the City of Milledgeville Main Street/DDA winning the national Great American Main Street Award for our vibrant downtown. In its fourth year, the Hometown Celebration has quickly become a favorite event in Milledgeville. After many requests, the event has been moved from Fall to Spring to avoid the blistering heat and take advantage of Georgia’s beautiful Spring weather. The event is also being held on Saturday, instead of Friday evening, allowing more time to enjoy the block party. On Saturday, April 22 from 2 - 10 pm, the 100 block of West Hancock Street will be OPEN to pedestrians for the 4th Annual Hometown Celebration! Bands will play throughout the day and popular lake country band, Blind Driver, will close out the evening. 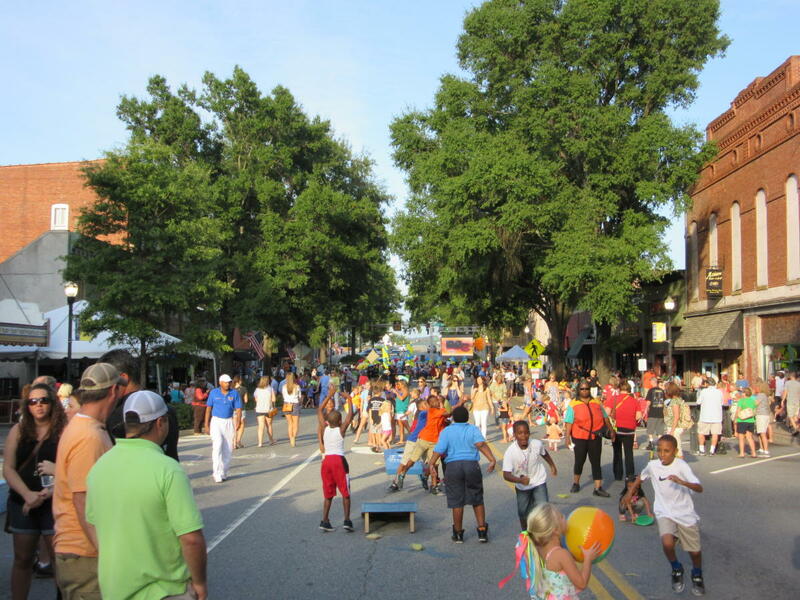 There will be activities the entire family can enjoy, including trolley rides courtesy of the Milledgeville-Baldwin Convention and Visitor’s Bureau and a large inflatable from sponsor, The Party Jumper. Local community organizations will be setting up with fun activities and downtown businesses will have special sales. Again this year, the Old Capital Car Club will be returning to show off some of their boss cars! Live entertainment will be provided during the event. Taking the stage at 2pm will be The Scott Little Band. The Scott Little Band takes you on a ride through small town American life, leaving you feeling like you were wrapped in a musical blanket. Crafting songs into stories that take the listener through all life’s traps and freedoms, this storytelling four-piece band has more than succeeded in their goal of making real music. Pulling from influences such as Haggard and Parsons, they make music the old-fashioned way, they live it...then they play it. At 4pm, The Majestics take the stage to entertain the crowd with classic rock from the 60s, 70s, 80s as well as a little Country. This four-piece band is local to Milledgeville and have played extensively in town. Headlining the Hometown Celebration will be Blind Driver. The group of skilled classic rock artists play 70s and 80s music. Think of the guitar driven rock bands of the 70&apos;s, even the hair bands of the early 80&apos;s, and it’s easy to see where they get inspiration. Integrating songs they love, from memories of high school years through today’s rock infused hits, their musical muses are a vast range including Bad Company, Bachman Turner Overdrive, the harmonies of the Eagles and the Doobies, the folksy and funky blues of Creedence Clearwater and Delbert McClinton, and even the harder rock of AC/DC and Van Halen. Blind Driver will take the stage at 7pm and entertain the crowd until 10pm. Milly the Owl will be out and about for the celebration as well. Pictures with Milly are welcome, she loves the attention! Milledgeville Main Street encourages the use of #ilovemilly during the event when sharing pictures on social media. Main Street/ Downtown Development Authority Board of Directors and staff will have a table set up with some great swag and information about programs offered. This year, thanks to sponsor, The 42nd Floor, there will be a limited number of exclusive Hometown Celebration T-shirts available for only $10. A suggested donation of $5, to continue the Hometown Celebration next year, is also encouraged and appreciated. A huge thanks of appreciation is given to the fabulous event sponsors; The Union Recorder, The Grove Apartments, The Party Jumper and the 42nd Floor, for helping continue this free community event. For links to our sponsors, visit www.milledgevillemainstreet.com. For more information about the event, contact the Main Street Office by phone at 478.414.4014 or email at dthornton@milledgevillega.us.